Are you looking for ideas for healthy apple snacks for kids? A snack food, in Western culture, can be classified as a type of food not meant to be eaten as a main meal of the day, such as breakfast, lunch, or dinner, but rather a food taken to satisfy a person's hunger between these meals. A snack provides a brief supply of energy for the body. A snack may also refer to a food taken simply for enjoyment, or for the taste of flavour to be enjoyed. As a parent myself, I understand how difficult it can sometimes be to ensure children eat healthy snacks, including fresh fruit. I have found it to be extremely important how the snack is presented to the child. For example, offering a child who is not particularly fond of fresh fruit, an apple for a snack may meet with some resistance. However, if the apple is cored, sliced, and offered with a spread, topped with yogurt, or nuts, or a fruit dip, the attractive snack will be accepted with a smile and open hands! Worried about sliced apple slices turning brown? Wash, core and slice an apple horizontally. Spread peanut butter on each "slice", and garnish with chopped pecans (or other desired chopped nuts). Quick, easy, and scrumptious! Yummy Apple Snack for Kids! Apples are a good source of a natural energy, containing natural carbohydrate, Vitamin C and potassium. This fruit is low in calories. An average size apple contains only about 80 calories. Eating apples with the peel left on is the best way to consume this fruit. Apples are a source of flavanoids, with the majority of this property found in the peel. Flavanoids are beneficial to the body because of their antioxidant properties. Antioxidants help prevent and repair oxidative stress, a process that damages body cells and has been linked to the development of diseases such as cancer, heart disease and Alzheimer's disease. Did you know that apples are also a very good source of dietary fibre? In fact, an average size apple is said to contain more fibre than a bowl of oatmeal or most cold cereals! Remember, the rhyme, " An apple a day keeps the doctor away "? Apples have long been recognized for their nutritious value and health benefits! 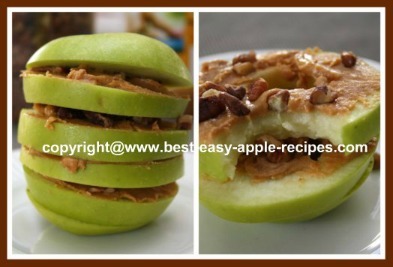 There are many different apple snack recipes throughout this website that can be used as "snack food", however, I have indexed specific apple snack recipes at the bottom of this page (scroll to bottom of page). For some snack recipes, or just for eating peeled apples out of hand, you may want to invest in a mechanical apple peeler and corer. These are inexpensive kitchen gadgets that help to make apple peeling and coring a quick work. Whether you are looking for a snack idea for the children's lunch bag, for "after school", for a picnic, or to enjoy while watching a movie, or whenever...anytime...can be "APPLE Snack Time"!